Tulips bloom at the same time as dogwoods and other spring-flowering trees in most areas. Perennial candytuft makes an ideal companion plant. Planting tulips behind daylilies or other summer-blooming perennials hides the fading foliage from view. Tulips are often eaten by rabbits. Hot pepper sprays help to deter these nibblers. Tulip bulbs require 6-8 weeks chilling in a refrigerator before planting out in warmer areas. 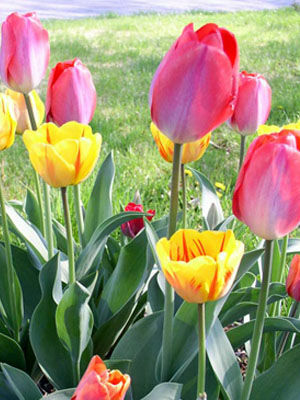 Tulips are best treated as an annual in warmer areas.